Thanks to Joanna Wrangham's research on the Winter Palace, I now have an image of the cabinet where Empress Alexandra's Imperial Easter Eggs were kept, on the photo above, to the right of the Emperor! I am really happy with this photo for of course we know how in the Alexander Palace Maple Room corner cabinet the Eggs were kept, and I always hoped for a similar photo for the Winter Palace. As you can read in the blog, the date this photo was made is not yet known, but Joanna places it c1899-1900. 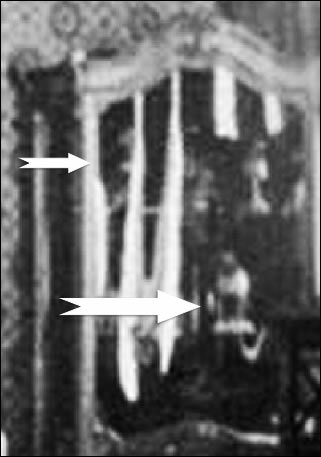 I however can clearly see the 1900 Transsiberian Railway Egg in the vitrine (large white arrow), so the photo must be post Easter 1900. For me, on the top shelf, the most left item is the 1899 Madonna Lily Clock Egg (small white arrow), with the white band with the flowers on top; and perhaps the 1896 Egg with Revolving Miniatures on the same shelf on the right. An inventory dated 1909 is known (see below) describing on which shelf the Eggs where placed. From the enlargement above, it looks as if the Eggs at the time the photo was made, where differently arranged, as in the inventory the 1900 Transsiberian Railway Egg is being described placed on the top shelf. 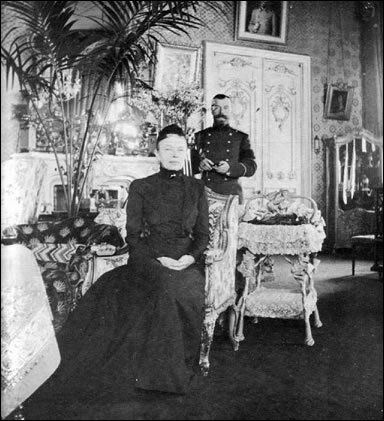 Alexandra Feodorovna received 20 Imperial Easter Eggs, starting in 1895 with the Rosebud Egg and ending in 1916 with the Steel Military Egg. Below are pictured all twenty Eggs.